Mohamed Abdel Hakim Amer (Arabic: محمد عبد الحكيم عامر‎‎, IPA: [mæˈħæmmæd ʕæbdelħæˈkiːm ˈʕæːmeɾ]; 11 December 1919 – 14 September 1967) was an Egyptian general and political leader. 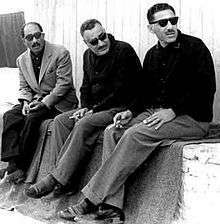 In March 1964, Amer was made first vice-president to Nasser and deputy supreme commander, with the power to rule for 60 days if the president was incapacitated. 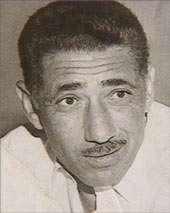 Amer's distinguished career came to a sudden end after Egypt's crushing defeat by Israel in the Six-Day War of June 1967. Many historians have stated that much the Egyptian military's failures in the 1967 war can be laid at the feet of Amer. This is because Amer's control of the Egyptian military establishment followed in line with leader Gamal Abdel-Nasser's general policy of presenting different government institutions as fiefdoms to those most loyal to him. In addition, the proxy war Egypt (with Soviet backing) fought against the Saudis, West, and Israelis in the North Yemen Civil War (1962–1970), Nasser supporting the Yemen Arab Republic against the Western and Saudi Arabian backed Royalists, is also viewed as being key to Egypt's defeat in the 1967 Middle East war; as nearly half of the Egypt's Western-trained officer-corps (mostly in Britain at Sandhurst) was in Yemen at the time of the initial Israeli attack on Egypt. When Amer heard of the fall of Abu Ageila to Israel, he panicked and ordered all units in the Sinai to retreat. This order effectively meant the defeat of Egypt. Shortly after the Six Day War ended, he was relieved of all his duties and forced into early retirement. 1 2 3 Spencer C. Tucker; Priscilla Mary Roberts (12 May 2008). The Encyclopedia of the Arab-Israeli Conflict: A Political, Social, and Military History: A Political, Social, and Military History. ABC-CLIO. p. 99. ISBN 978-1-85109-842-2. Retrieved 21 February 2013. 1 2 "Tough Times for Nasser". Time. 22 September 1967. Retrieved 14 October 2008. 1 2 "Military prosecutor to investigate death of former Egypt defence minister Abdel-Hakim Amer". Al Ahram. 6 September 2012. Retrieved 21 February 2013. 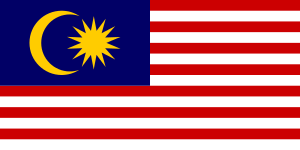 ↑ "Senarai Penuh Penerima Darjah Kebesaran, Bintang dan Pingat Persekutuan Tahun 1965." (PDF).